Dark of the West by Joanna Hathaway seamlessly weaves espionage, intrigue, and an puts emphasis on war tactics into her YA fantasy debut. Athan Dakar has a lot to live up to, with two older brothers already Commanding Officers in the military and a father who just so happens to be the General. A pilot in the Academy, Athan’s goal is to be a transport pilot and not make Top Flight because unlike the rest of his family, he doesn’t want anything to do with the upcoming war. His father, though, has other plans for his youngest son. Aurelia Isendare may be a princess, but she refuses to be contained within the confines of her station. She’s been allowed freedom to do as she pleases, such as exploring the woods around the palace and spending her time painting, up until she learns that she’s to be married off. She doesn’t want to leave her family, her mother the Queen and her brother, Reni, the heir apparent, but political alliances must be made and she is to be used as a pawn to garner peace. On the brink of war, the General and his oldest son, Arrin, visit Etania with a contingent of pilots, of which Athan has been placed as a spy for his country. He’s to not let anyone know who his father is, in hopes of learning about Etania’s secrets. Under threat of the General, Athan has no choice but to comply to his father’s wishes. This leads to Athan catching the eye of Aurelia, who believes him to be a lowly Safire pilot. Dark of the West has the perfect mixture of political intrigue, war tactics, and forbidden romance. It is seeped in militaristic tones but isn’t overbearing. Obviously written by a war buff, Joanna Hathaway brings the Glass Alliance series to life with her wartime knowledge. It brings a level of realism to this fantasy world, leaving me on the edge of my seat as I fell in love with the characters, plot twists, and intrigue. I found it interesting, albeit confusing at first, that the prologue is set at a later period in the series. I had no frame of reference for the situation, or the emotional ramifications. That being said, as soon as I finished the last line of Dark of the West I immediately went back and reread the prologue with a deeper understanding and appreciation. My heart beating out of my chest, with tears in my eyes, I couldn’t reread the prologue fast enough. The emotional punch that was missing when I started the book was there, goosebumps across my arms, the heartache I felt was mirrored on the page. It worked, though belatedly so. By stating in the prologue what was to happen, it actually made me want to immediately reread the entire book, not just the prologue. It left me thinking about the book for days, even weeks, later. I can’t wait to read the rest of Athan and Aurelia’s journeys to see how they get to the time of the prologue, because it is going to rip my heart out and step on it and I’m here for it. As a fan of reading about intrigue, deception, and fantastical wars, Dark of the West was the perfect book for me. The romance was subtle, with the spotlight remaining on the workings of the plot unfolding. With pressure from his father to get information by holding his best friend’s life as ransom, Athan’s decisions have ramifications and the unfurling of those consequences makes this book a page turner. The balance between plot and romance was perfect, since I don’t like being beaten over the head with romance and enjoy subtle slowburn. The forbidden romance aspect was handled realistically with hesitation on both Athan and Aurelia’s parts, making the romantic plot rife with tension and a sense of “will they or won’t they”. Not only was the romantic relationship well thought out, but the platonic ones were as well. Athan’s loyalty to his best friend Cyar endeared him even more to me. Familial bonds were strong between Aurelia and her brother Reni, and although strained, Athan’s relationship with his brothers brought another layer of realism to a fantastical world. No relationship is perfect, and sibling rivalry and a certain level of protectiveness despite differences adds so much to the story. Double agents and wartime atrocities bring a highkey, blood pounding level of anxiety to the book that leads to an explosive ending, leaving me hoping that there won’t be much of a wait for the second book in the Glass Alliance series. As a debut novel, Dark of the West doesn’t disappoint and is a must read for fans of The Way of Kings by Brandon Sanderson and Legend by Marie Lu. 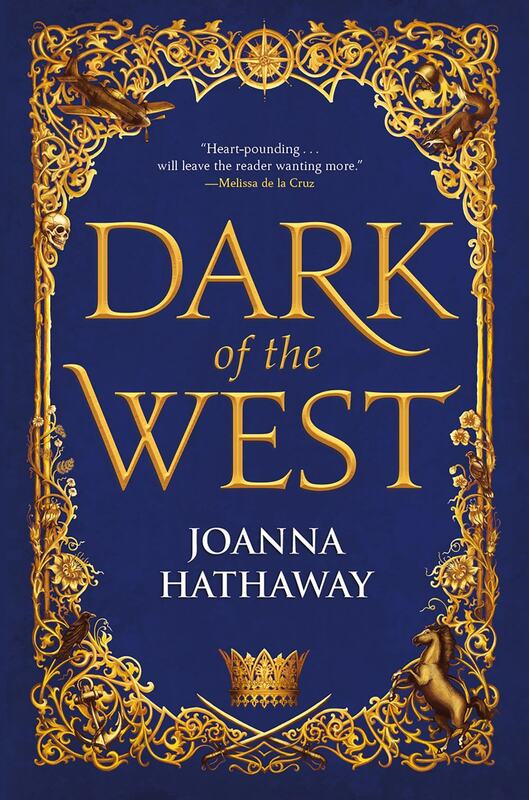 Dark of the West by Joanna Hathaway comes out on February 5, 2019. Find it on Amazon, Audible, Barnes & Noble, and Book Depository, or add it to your Goodreads list.